According to the hummingbirds Callistemon viminalis should probably be planted in every hummingbird garden where the Winters are warm enough. The Weeping Bottlebrush almost always has at least 2 hummingbirds competing for the nectar. The bright orange-red flowers are well colored to attract hummingbirds. Callistemon viminalis is often used as a street tree, maybe more often than it should be. 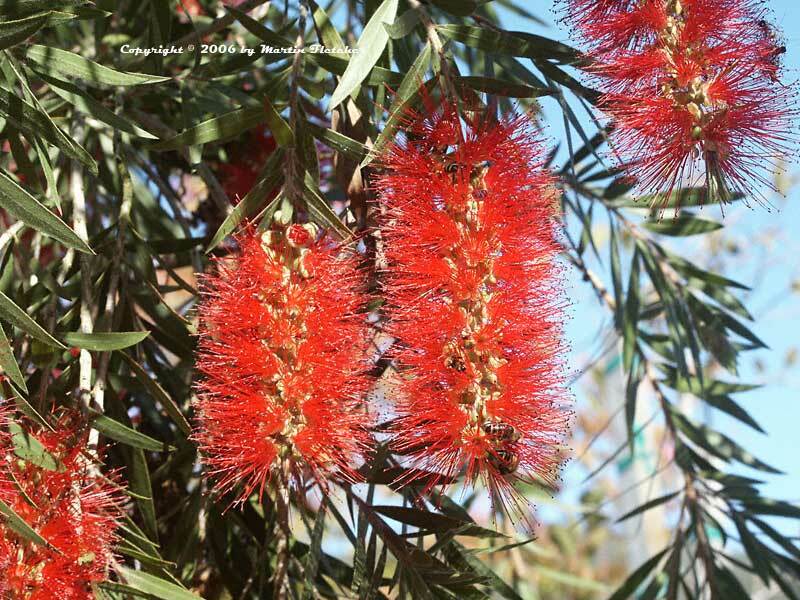 For confined plantings Callistemon viminalis has a laundry list of problems. The two worst, Weeping Bottlebrush will drop large amounts of debris and the roots will raise sidewalks, often by several inches. But if they are given the right space the Weeping Bottlebrush is a spectacular specimen. I prefer to open out the inside of the Weeping Bottlebrush Tree to show off the branching structure and the grace of the tree. Callistemon viminalis will put up with almost any soil. Once a season or to has been given to establish Callistemon viminalis the trees will fare pretty well on natural rainfall for coastal and valley gardens except when conditioins are exceptionially dry. The weeping bottlebrush is hardy through 20° F.
Flowers and foliage of Callistemon viminalis the Weeping Bottlebrush. High resolution photos are part of our garden image collection.